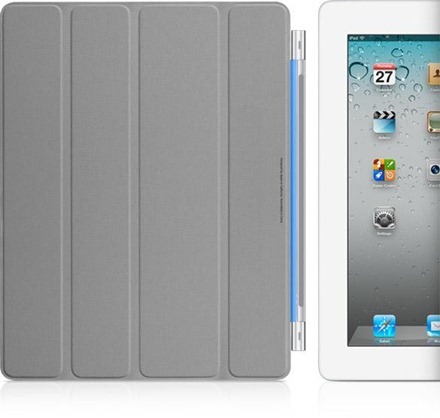 Apple has done a minor refresh on their line of Smart Cover cases for the iPad 2. In particular they’ve made some changes to the polyurethane line of smart covers. They’ve discontinued the orange cover and replaced it with a dark gray one. Another change is that the microfiber lining inside the polyurethane covers is now color-matched to the cover itself – and the covers are said to be ‘more vibrant’. Pricing for the polyurethane and leather smart covers remains the same – at $39 and $69 respectively. I’ve been wanting to try out one of the polyurethane smart covers for a while now (I currently use a navy blue leather one) and I ordered a dark gray one this morning. I should have it by around the end of the week. 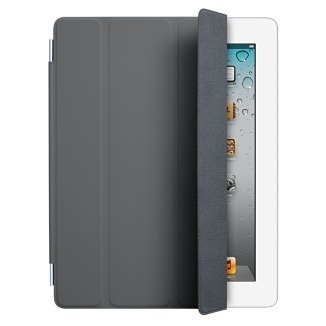 You can have a look at the full range of iPad 2 smart covers at Apple’s iPad accessories page. As I’ve mentioned here a lot lately, Apple’s iPad 2 Smart Cover has become my new best pal and my favorite iPad 2 case by a landslide margin. I’ve found a few full-protection sort of cases for the iPad 2 that are quite good, but I always find myself returning to the smart cover as my most-used option. Recently I’ve also been trying out a handful of cases that are ‘iPad 2 smart cover compatible’ – i.e. cases that are back covers designed specifically to work as companions to the iPad 2 smart cover. I’m gradually discovering that even the lightest of these (that I’ve tried so far) make the iPad 2 feel quite a bit heavier. This discovery has lead me to start thinking about more minimalist alternatives for use with the smart cover. I already use Ghost Armor screen protectors on the front and back of the iPad 2, so one option is to just stick with the smart cover and these. Another is to look at skins for the iPad 2. My friend and writing colleague Thomas (@ragart) has been singing the praises of Gelaskins – and this weekend I took a look and ordered a couple. I’ve been using an Apple Smart Cover for my iPad 2 since Day 1 of owning it. Not so much because I love the smart cover – as I’ve said before, I have very mixed feelings about it. I’m using it constantly because all the iPad 2 cases that I want are not yet available – I’ve got three on order, but none has shipped yet, and Apple and other retail outlets near to me have either zero or very limited options for 3r party case for the iPad 2. So for now my iPad 2 uses just the smart cover ( a navy blue leather one) and front and back screen protectors from Ghost Armor. Now that I’ve had a few weeks of usage with the smart cover, I’m finding this really isn’t true. One of the first third party iPad 2 cases with smart cover support should be available for order today. The Miniot Cover for iPad 2 is made of real wood, and actually looks very nice in the video demo above. I’ve never found wood cases and covers hugely appealing but this one has caught my eye. I especially like the fact that it seems to work better as a stand than Apple’s smart cover.